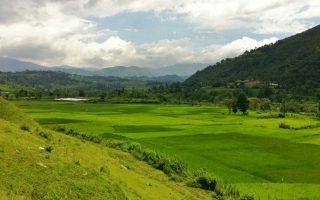 Nepal is a diverse country with a varying landscape, rich bio-diversity and diverse culture of the people residing in it. Each community holds their unique cultures and traditions which they have been following for centuries. Each of them has their own set of beliefs and festivals to celebrate. No wonder Nepal is called the land of festivals. Every day is a day of celebration for one or the other community. The best part of all is one’s pride in one’s own culture and respect for the others’. This is why these numerous cultures and festivals are harmoniously coexisting in Nepal. It is impossible to mention all the festivals celebrated in Nepal, but we have tried to include the popular festivals celebrated by majority of people. Lhosar (or Losar) means ‘New year’. It is celebrated by Buddhist people from different parts of Nepal. Different communities celebrate Lhosar at different times of the year. Because of this, there are three Lhosar festivals- Tamu Lhosar, Sonam Lhosar, and Gyalbo Lhosar. Tamu or the Tola Lhosar is celebrated by the Gurung community, Sonam Lhosar is celebrated by the Tamang and Yolmo communities, whereas Gyalbo Lhosar is the festival of the Sherpa and Tibetan communities living in the hilly terrain. Lhosar is celebrated with family feasting, dancing, and gatherings. On this special day, Buddhists read prayers, decorating houses and monasteries, offer special foods to different deities and other cultural proceedings. 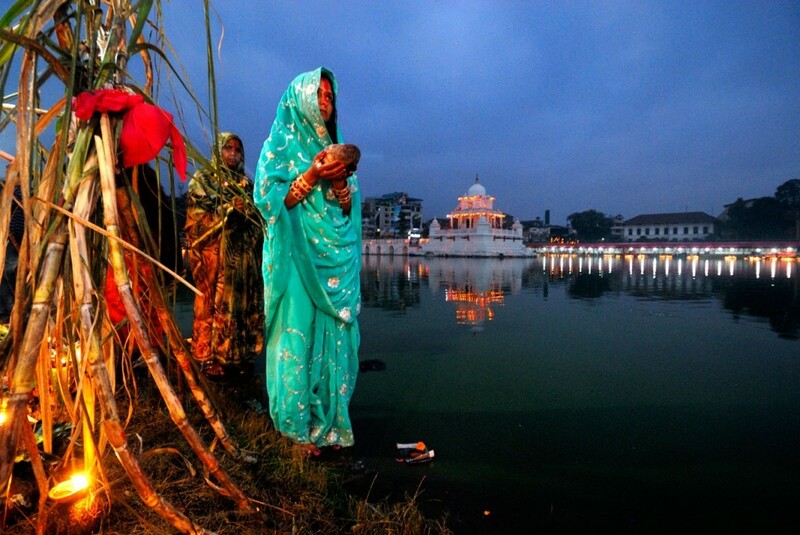 Chhath Parva is a four-day festival celebrated in October or November by the natives of the Mithila region. It is the biggest festival of Terai people. The festival is celebrated by worshiping Sun God and thanking him for nourishing life on earth. The worshipers fast during the day for longevity and prosperity of the family members and worship the setting Sun. Devotees sum up the festival by offering water to the rising sun the next morning after day-long fast. Other rituals observed during this festival are holy bathing, diving in water for a long time, offering foods to the Sun God, etc. Thekuwa and Anarsa are two unique sweet dishes prepared during Chhath. 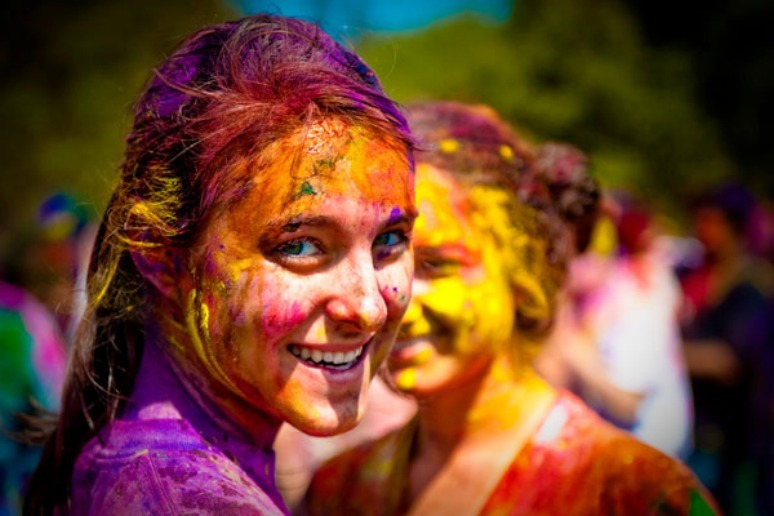 Fagu Purnima or Holi is known as the festival of colors and falls between February/ March. This lively festival is enjoyed by playing with colors and water. The day is supposed to be a celebration of the death of ‘Holika’, someone who tried to kill Vishnu’s devotee Prahlad. She and Prahlad were both lit, but only Holika burned to death. This could be the reason for splashing each other with water. Holi marks the arrival of spring as well. Days start to get warmer and colorful flowers bloom. Holi is celebrated on two different days. Hilly region of the nation celebrates the festival on the day of the full moon while the Terai region celebrates it the next day. 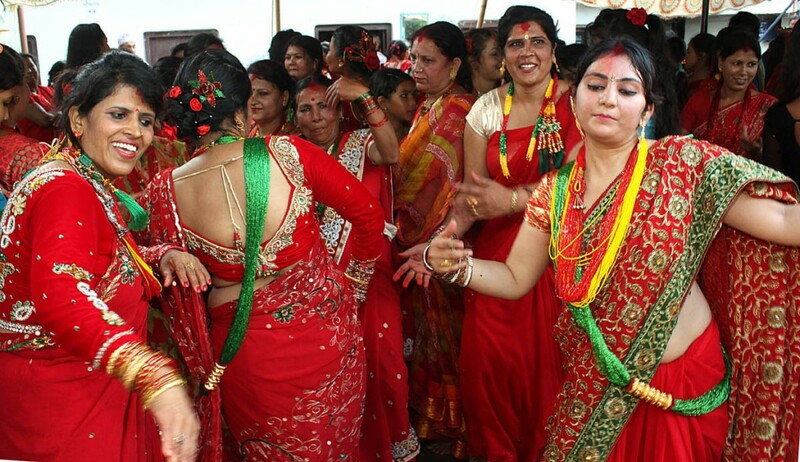 Dashain is considered a major festival of Nepal as about 80 percent of the people are Hindu. This most auspicious festival is celebrated to rejoice the victory of good over evil. The festival is observed for 15 days. 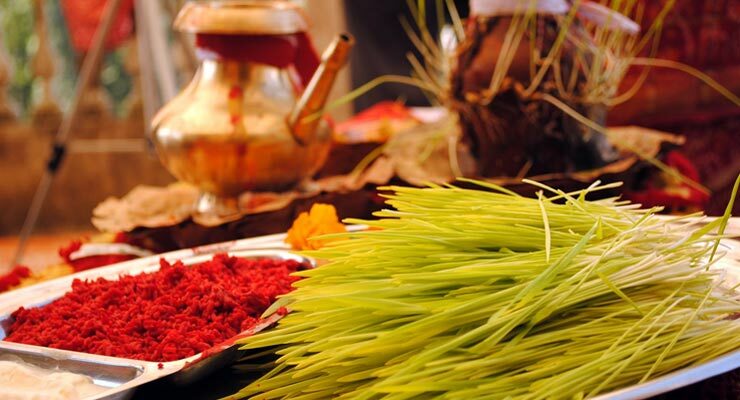 Ghatasthapana, the first day of Dashain marks the beginning of this festival. Families worship the Ashta-Matrikas (the 8 Tantrik Goddesses) and the nine avatars of Durga (the 9 Goddess Durgas) for the remaining nine days. 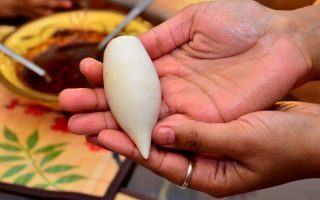 On the tenth day, people receive Tika and Jamara along with blessings from the elders and this continues for the next 5 days. The last day of the festival is on the full moon day and is called ‘Kojagrata’ Purnima. Although it is celebrated by a majority of Nepalese, the way of celebration varies according to communities. Tihar is a five-day long festival that takes place 15 days after Dashain celebrations. The festival is celebrated by worshipping crows and dogs on the first two days respectively. On the third day, people worship cows in the morning. While Dipawali (Lighting) is observed in the evening by worshipping the goddess of wealth- Laxmi and lighting candles in the house. Oxen is worshipped on the fourth day and Govardhan Pooja is conducted during the evening. 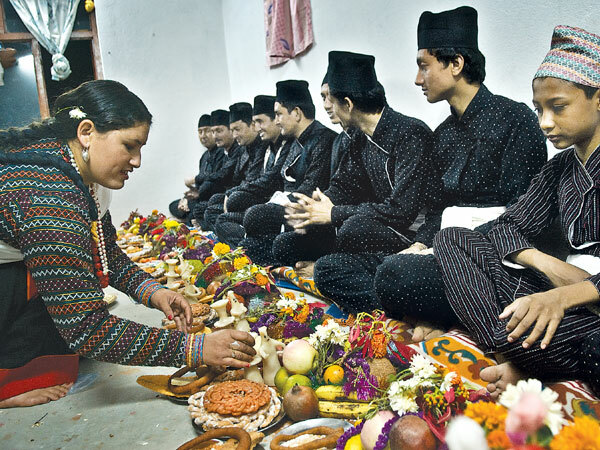 Newar community, however, celebrates New Year and performs Mha Puja on the fourth day. The last day of Tihar is Bhai Tika (Brother’s Day). It is celebrated by rejoicing the pleasant relationship between the siblings. On this auspicious day, sisters put Tika on their brother’s forehead to wish them longevity and good health. 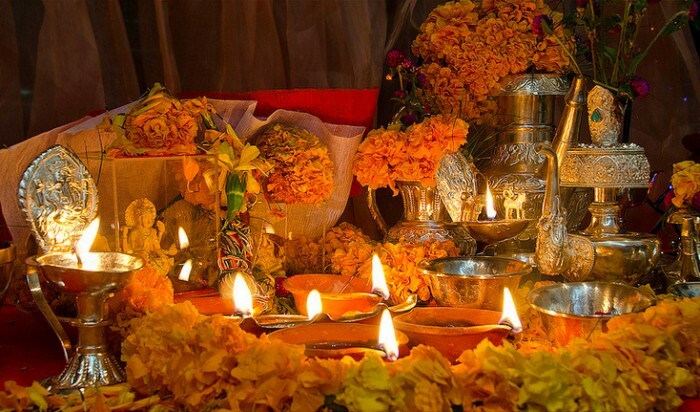 Mha Puja is celebrated by the Newar community on the fourth day of the Tihar. This day is New Year according to Nepal Sambhat. Mha Puja is celebrated by performing a ritual puja to purify and empower one’s body and soul. Family members sit in a row on the floor with mandalas (sand painting of a sacred circular diagram) drawn in front of them. They then follow various rituals and light the mandala to purify and thank the body they live in. Teej is a Hindu festival celebrated by women in the month of September/ October. The festival is observed for three days. On the first day, married women fast for the longevity and prosperity of their husband and unmarried women fast hoping for a good husband. The other two days are followed by ritual puja to make Lord Shiva happy. It is celebrated by singing and dancing. Women dress in red Saris and wear different ornaments. And, they gather together to dance and sing about womanhood. They visit their relatives and enjoy various sweets before and after the fast. Buddha Jayanti is the birth anniversary of Gautam Buddha- light of Asia. Buddha was born in 563 BC in Kapilvastu, Lumbini. Therefore, it is an auspicious day, not just for the Buddhists but also for the others in the country. 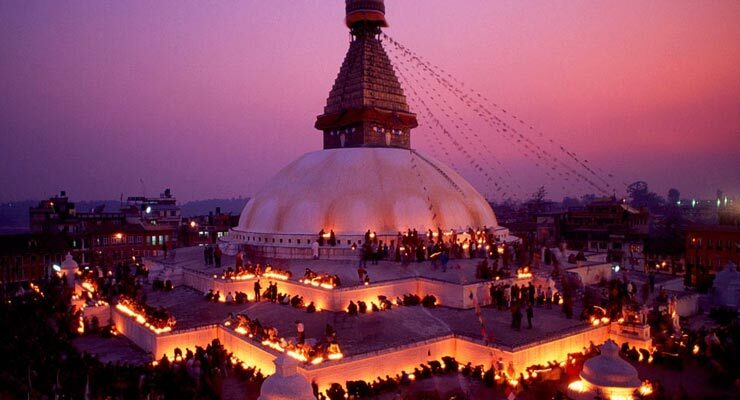 People visit Swayambhunath, Boudhanath, Lumbini and other stupas and monasteries during the day. The beautifully lit butter lamps make these holy sites look more magical in the evening. One may observe parade or large gatherings where monks, nuns, and followers read prayers and tell moral or life story of Lord Buddha. People do Dana Dharma to show generosity by helping others. Nepal is rich in cultural and traditional practices. The country observes many other festivals like Eid, Christmas, Gathe Mangal, Sivaratri, Krishnasthami etc. Kathmandu valley itself observes numerous Jatras (festivals) like Ghode Jatra, Bhoto Jatra, and others. While some of these come from the epics and legends of Hinduism and Buddhism, others are the result of age-old traditions, cultures of bygone kings and historical events. Jatras are usually long processions from one part of the city to the other carrying various deities in chariots called ‘raths’ with mascots according to the theme of the Jatra. 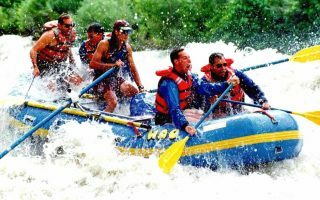 Following are some of the most spectacular Jatras celebrated in the valley. Bisket Jatra falls on the first month of Nepalese calendar. It is celebrated specifically in Bhaktapur. The myth behind the festival is that there was a princess whose husbands kept dying on the wedding bed. This was problematic for the royal family. Then came along a prince, blessed by the Goddess, who found a pair of serpents crawl out of the sleeping princess. He killed them and the princess finally remained married. During this festival, chariots of Lord Bhairav and Goddess Bhadrakali are pulled through different parts of the city. At Lyasinkhel, a tall pole with two embroidered clothes, representing the serpents, is erected. As it is celebrated to mark the death of the serpents, it is also called Bisyau Jatra, meaning slaying of the serpents. Because it begins from the end of Chaitra to the beginning of Baisakh, it is also known as the festival of the New Year. Ghode Jatra (the horse parade), celebrated during Chaitra (March- April), is another festival that unites all the people of the valley. Though there is no religious background for the parade, it is believed that a demon spirit was buried under Tundikhel and the horse parade ensures that it does not return from the burial site. Newars from the valley involve in gatherings or parties during this festival. The festival is marked by various parades, athletics, acrobats etc. performed by the Nepalese army in Tundikhel which a number of high ranking officials of the country attend. Bhadrakali, Kankeswari, and Bhairav are deities worshipped during the day. 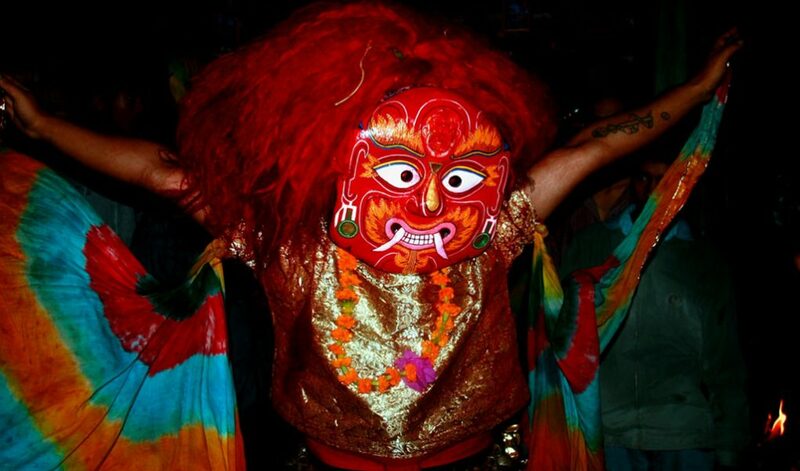 Gai Jatra is a Nepali version of Halloween. This festival is celebrated with a number of events full of humor, satire, jokes, etc. as it is legally allowed to make jokes about anything and anyone that day. A number of magazines, TV shows, and theatre plays show comical plots. The Historical origin of the festival, according to evidence, is that after the death of his son, King Pratap Malla was very worried about his queen who was grief-stricken. So, he announced that every family who had lost a member would join a procession to showcase the pics or symbols of dead family members in the form of Cows. People in the procession are dressed ridiculously or as ghouls. They make funny faces and jokes so that people would forget the grief of losing their loved ones. Rato Machhindranath Jatra is one of the most significant festivals in Patan. An entire chariot is erected from the wood and bamboo from selected forests of the country having religious importance. The festival is commenced by a Paaneju priest placing the idol of Rato Machindranath inside the chariot. As Rato Machhindranath is a deity worshipped by many Hindus and Buddhists in the valley, the chariot is carried through a number of places in and around Lalitpur including Gabahal, Sundhara, and Lagankhel. Rato Machhindranath is also worshipped as Padmapani Lokeshwor, Avalokiteshvara and Aryavalokitesvara and Karunamaya. He is believed to have been brought from Assam when Kathmandu valley was suffering from a long drought. He blessed the valley with rain then and is still worshipped to welcome the rainy season. The festival comes to an end on Bhoto Jatra when an elegant Bhoto(vest) is shown from the chariot to the public. Then the chariot is dismantled and the idol of Machindranath is kept at a temple in Bungamati village for next six months. This festival is celebrated to honor Lord Indra, the God of rain. It is celebrated for 8 days, mainly in the Kathmandu Durbar Square, and was started by King Gunakamdev after setting the city of Kathmandu in the 10th century. Kumari Rath Yatra was later added to the celebration in the 18th century. The history behind the festival states that when Lord Indra was fetching night jasmine from Kathmandu for his mother, he was captured and held captive by the locals. Once they realized they had captured Lord Indra, they were scared and immediately released him. Indra’s mother blessed the city for releasing her son. It is believed that Kathmandu receives enough dew even in winter months for cultivation because of the blessing. The different parts of the procession are the reenactment of this story like Dagin (Indra’s mother frantically searching for her son around the city) and Pulu Kisi (a dance depicting Indra’s elephant frantically moving around the city looking for its master). The festival starts with the erection of a pole called Yasin, which is made from a single tree with stripped branches and bark. The procession route in the historic parts of the city includes people lighting incense and candles as an homage to their deceased family members. The other attraction of the Jatra is the Kumari Jatra which includes chariots of Goddess Kumari, Bhairav, and Ganesh being pulled across different parts of the city accompanied by mascots and musical bands. Different Bhairavs (Sweta Bhairav, Akash Bhairav, and Baka Bhairav), Indraraj dyah and Dashavatar are exhibited during the festival while Pulu Kisi (elephant dance), Majipa Lakhey, Sawa Bhakku, Devi Pykhan, Mahakali pykhan are the various dance forms performed during Indra Jatra. Nepal is steeped in myths and legends. More than a hundred festivals are celebrated throughout the year. Every little gesture has a deep meaning behind it. Explore all this is very interesting, but to mention them all in one article is impossible. Therefore, only a select few of all the festivals of Nepal are mentioned here. 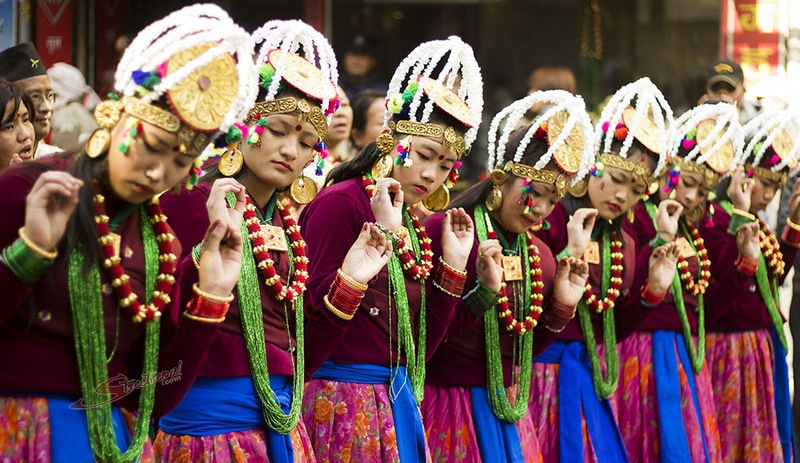 Check out our other articles to know more about the festivals celebrated in Nepal. Which is your favorite festival in Nepal? Share your experiences by commenting below.